Once the fish are located, experienced early season smallmouth slayers realize most anglers try their luck too deep. Lures that can be presented and suspended at mid-range depths are the ticket to early spring success. Hard-bodied jerkbaits, like Rapala’s X-Rap Slashbait, Sebile’s Action First Star Shiner and Shimano’s Coltsniper, are popular pre-spawn bronzeback lures. No matter the brand of bait, matching the lure’s profile with the size and shape of the predominant forage fish is more important than patterns or colors. The exception is when fishing extremely clear water, when you may need to do your best to closely match the hatch to be successful in fooling the fish. Retrieve speed can be important as well this time of year, when the mantra is, “The colder, the slower.” Once water temps top the mid-50s, you can quicken the pace to prompt the bass to do their part. Michigan bass guide Chris Noffsinger tempts smallmouth early each spring using suspending jerkbaits and a twitch technique that has netted him bronze from waters across the Midwest. He begins fishing each season when he notes area water temps approaching the mid-40s. Noffsinger targets water depths as deep as 18 feet in search of suspended smallmouths. His tactic is to cast, reel in only a few feet for a quick dive, and then just let the lure sit motionless, suspending up to two minutes before giving it another twitch. “I have my customers pause the bait so long between twitches that some of them actually get bored,” says Noffsinger. “But the next thing you know a big bass engulfs their bait, and boredom instantly turns to elation. When it comes to equipment, Noffsinger uses a 6 1/2-foot medium-action rod with a fast tip. Fluorocarbon of 8-pound test is his line preference. As for the size of suspending jerkbaits, he recommends matching the forage fish in the system. Baits in the 3- to 4 3/4-inch range are routine fish catchers in the waters he fishes. Another bait that catches early season smallmouth bass wherever they swim is the traditional lead-headed jig and twister-tailed grub combo. Jig-and-twister rigs can be fished on deep, main lake flats, shallow bay flats in the 5- to 15-foot range, or anywhere along the breaklines where smallmouths may be staging for the spawn. Consider swimming the combo slowly and steadily above the bottom instead of using the traditional hopping retrieve associated with jigs. 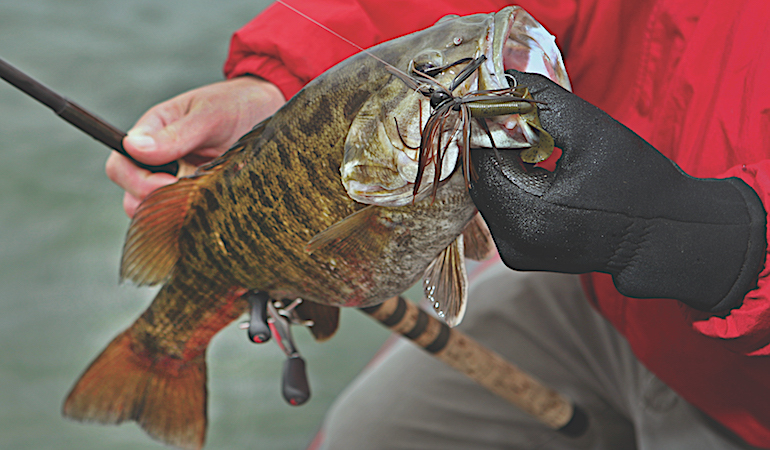 While the majority of anglers cast the lead-headed twistertails, some dedicated spring smallmouth anglers in the upper Great Lakes troll the combos this time of year to cover water over flats, using electric motors to ghost the offering along just off the bottom. Experiment with jig and trailer colors until you hook up. In clear water, consider translucent tails in lighter hues in smoke or watermelon. In roiled water, go darker — and bigger — to get the bass’ attention. As for the jighead, consider a tapered design in 1/16- to 3/8-ounce. Plain or painted jigheads work fine under normal water clarity conditions, but if the water is exceptionally clear, finicky bass may prefer jigheads that look more like the real thing. Mimic Minnow jigheads from Northland are a popular choice, and when combined with a Berkley PowerBait Minnow can be deadly, not only in early spring but throughout the season. Jigs also work well for spring smallmouth in rivers and streams, where hair jigs often get the nod. Once river water temperatures hit the mid-40-degree mark, many river anglers break out lead-headed jigs tied with rabbit fur or bear hair. Some place a twister tail on the hook to add to the attraction, and salt-infused tails are popular in some regions. Depending on the current, a 1/4-ounce jig is a good weight to begin with. The key is how to retrieve the bait ... or, more accurately, how not to. As with the suspending twitchbaits Noffsinger casts in still water and leaves unmoved for up to two minutes, when river fishing his tactic is much the same.He suggests wade- or drift-fishing anglers seek out undercut banks and holes, at least 4 feet deep, with rock or wood cover, and sycamore root-balls—all sites where lethargic bass can hang out and feel protected without fighting current. Casting a hair jig next to such lairs, allowing it to sink and letting the water move the delicate hairs and flutter the rubber tails, can draw strikes. Eventually inching the jig along, working the delicate baits slowly to stretch out each presentation to two minutes or more, can be the ticket to early season smallmouth success in rivers and streams. Veteran stream anglers know it pays to get on the water at the first inkling of rising water. The flow stirs baitfish and other food for smallmouths and can put the bass into a feeding frenzy despite sub-50-degree water. When rising water conditions are right, and air temps are inching up at the same time, crankbaits and surface lures will wreak havoc on smallmouths suddenly hit with the urge to feed after a long, lethargic winter.But anglers need to be ready and be on the water when the river conditions peak. The action can shut down just as fast, when water and air temperatures drop with passing cold fronts. As waters rise,but before they roil into the color of Nestle’s Quik, live bait can work wonders on especially finicky fish. The bass are active, realizing rain and/or rising water is uncovering and introducing all kinds of bite-sized critters into the water, which may rise a tick or two in temperature to boot. Thread chubs, minnows, worms or crawfish onto light, wire hooks and drift them naturally on a limp line into the holes. Allow it to sit there, much like fishing the hair jigs and suspended baits. The ultra-slow presentation can tempt or provoke otherwise reluctant bass into biting. Some serious early season smallmouth anglers pack bait hooks and a few split shot just for such instances. Even if they didn’t stop at the bait shop on the way to the fishing grounds, the fishermen know this time of year they can find all the live bait they need by prowling the shoreline and turning over rocks and logs to reveal grubs, salamanders and worms — even if it may be a bit too early and the water still too cool to find crayfish. These hand-picked, fresh-off-the-bank offerings are likely the same meals the bass seek out as rising waters mix things up. 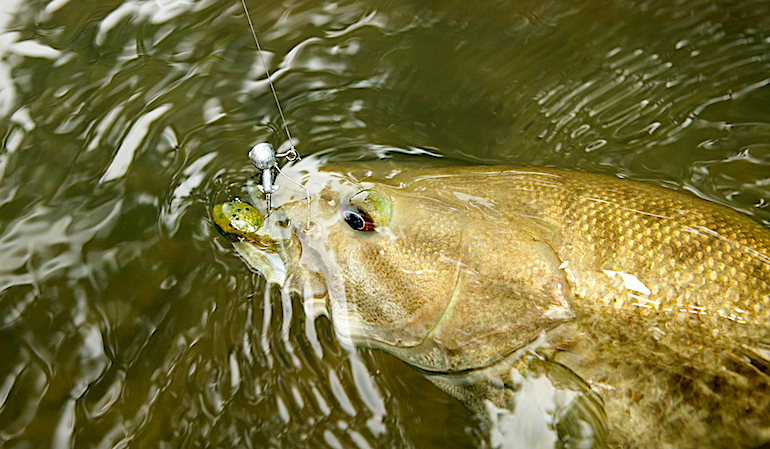 Smallmouths can be pushovers to eat a familiar live bait when they refuse everything else. This hunt-and-gather method for sourcing local baits is actually productive throughout the entire fishing season and has saved many trips for smallmouth anglers who were prepared to dig up natural baits in the name of hooking up. Once water temperature enters the 50s, smallmouth bass search for suitable spawning habitat, scattering as they do so. While many anglers figure most smallmouth spawn in the backs of coves and shoreline shallows, the majority tackle the process of procreation in main lake waters. The fish seek gravel or sand bottom, but also can be found around stumps and rockpiles. Many anglers believe the bigger smallmouths spawn first and do so in water deeper than where small bass spawn. At this point, the fish are the easiest — and for some, the most fun — to catch. Once the bass are on their nests, they will attack any threat that comes close to the spot, including from above. That’s when bronzeback anglers break out their surface lures and subsurface suspending baits, often able to watch the fish rocket from the depths to attack the lures. Zara Spooks are classic surface baits for this type of action, but any minnow-imitating lure can catch bass when they are on the beds. This is why some states regulate their smallmouth bass fisheries during spawning time: It can be just too easy to catch a mess of “brown” bass.